The Vintage Stand | Why did she make things? Well … she enjoyed it of course. Why did she make things? Well … she enjoyed it of course. I so love cooking a roast chicken with all the trimming. I will most definitely blog that one day. But this post is about what to do with the leftovers. Yes, I keep all the bit for a stock (another blog entry there too) but trawling the Internet you find a million ideas. So I am going to add to the list with my curried chicken leftovers. 1. Heat the coconut oil and a heavy based pan. 2. Add onions and a pinch of salt. Cook for 3 mins. 3. Add the garlic and ginger paste mix and cook for another 2 mins. 4. Now add the jar of tomato relish and the fresh tomato and stir through. Cook for 5 to 10 on medium heat. 5. Add dried parsley and 3/4 cup of coconut milk and stir through. Taste and add more curry powder if desired. 6. Cook on low heat while rice is cooking. 7. Just before serving add the juice of 1/2 lime and stir through the chicken pieces. 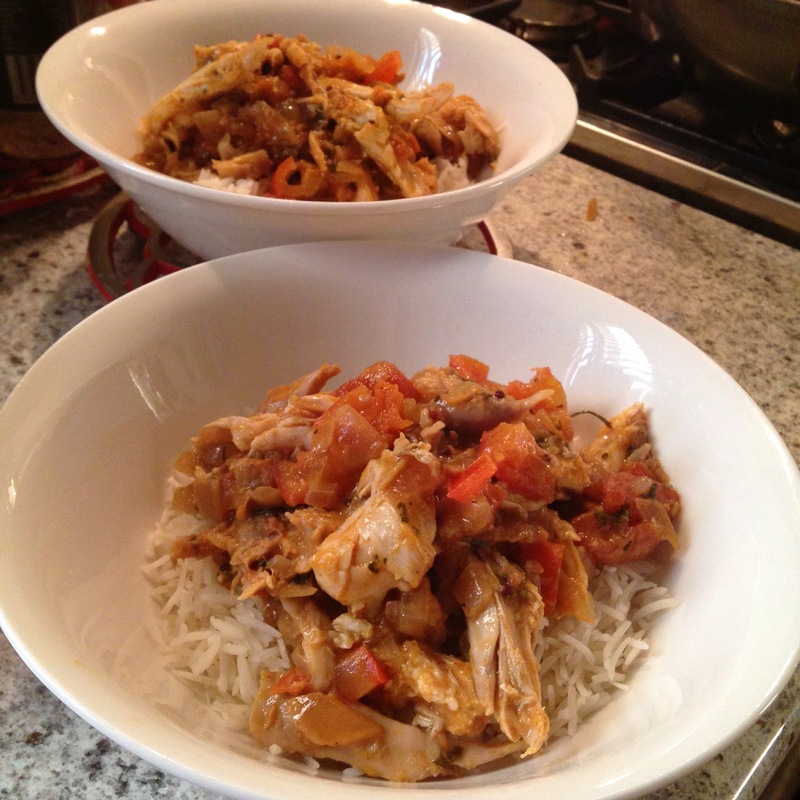 Warm through chicken and serve on a bed of coconut rice. A fabulous lazy Sunday dinner (15 mins total cooking time) with plenty of Monday lunch snacks. 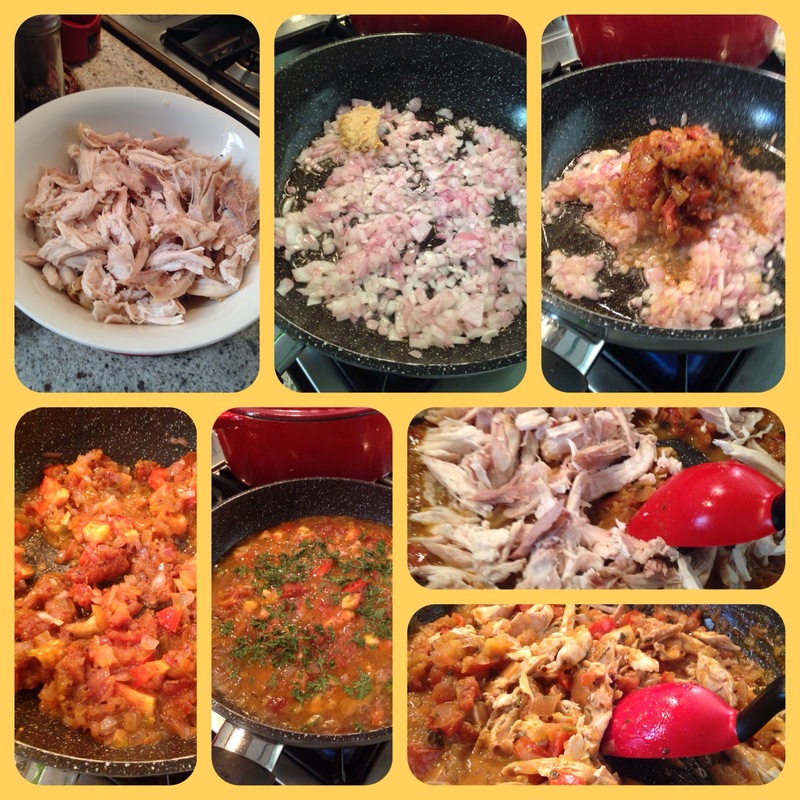 This entry was posted in Cooking Up a Storm and tagged chicken, curry, leftovers., roast on November 9, 2014 by thevintagestand. I am growing some fabulous bunches of parsley at the moment. The curly leaf and flat leaf variety. But what do you do when you have an abundance. You can only give away and cook with so much, right! So why not dry your own. I have trialled many methods, from hanging for weeks to rack drying in the sun and shade. It was time consuming and so messy. 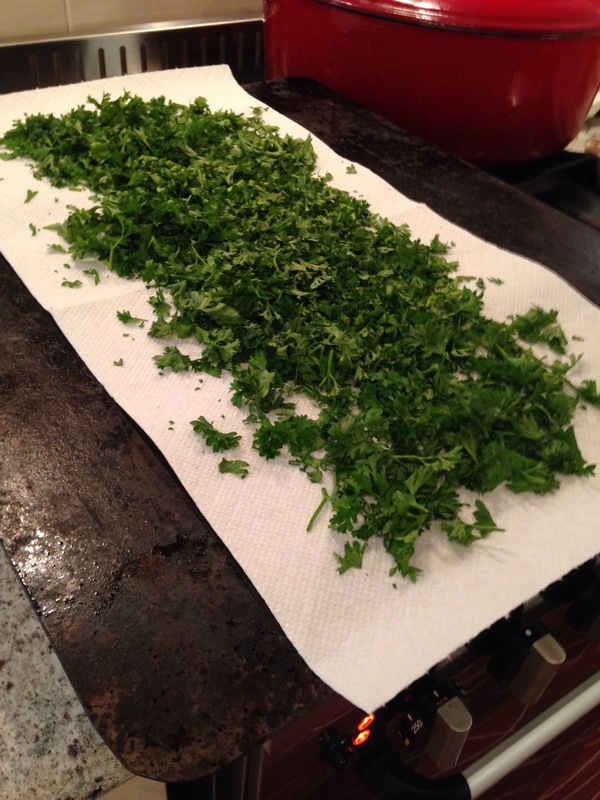 So can came up with a quick and easy method to dry parsley. It will keep for an age in an airtight container and retains its flavour and colour extremely well. I only complete this when I have a roast in the oven as you will need a hot oven for the final process, so why waste good oven time. Warm a cookie tray in the oven while you are getting your roast ready. Then pop your dinner in and remove the heated cookie tray. 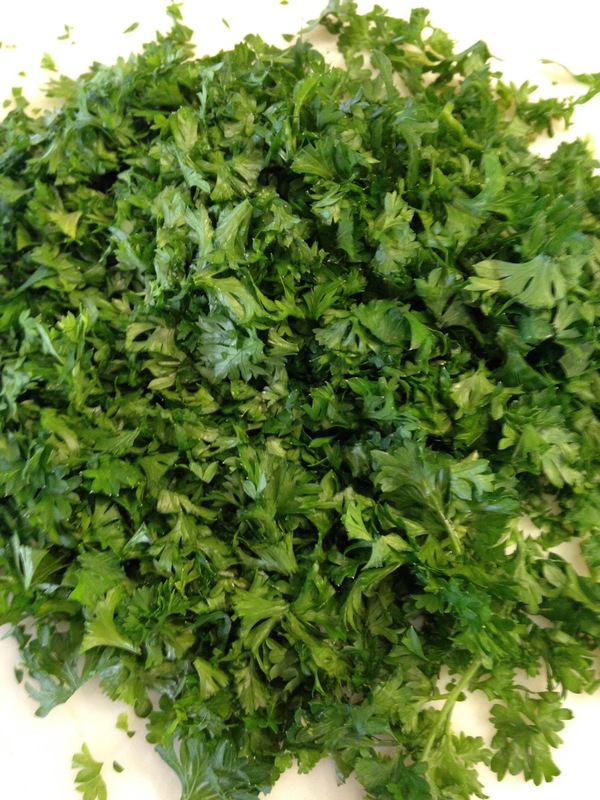 Cut your parsley at the end of the day when the leaves are dry and free of morning dew. If your leaves are NOT dry then don’t use this method. Storks are great to use as well. Next, chop your parsley up. Make sure the storks are finely cut. The drier the leaves, the quicker the cut. 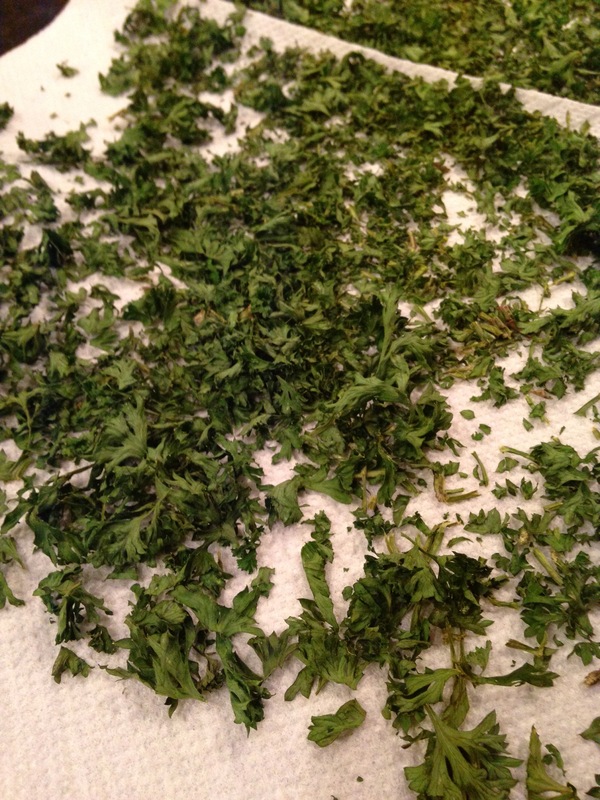 Now, spread the chopped parsley out on kitchen paper towel on the heated cookie tray. Leave it on top of your warm oven while your roast is cooking. Your parsley is slowly drying out here. 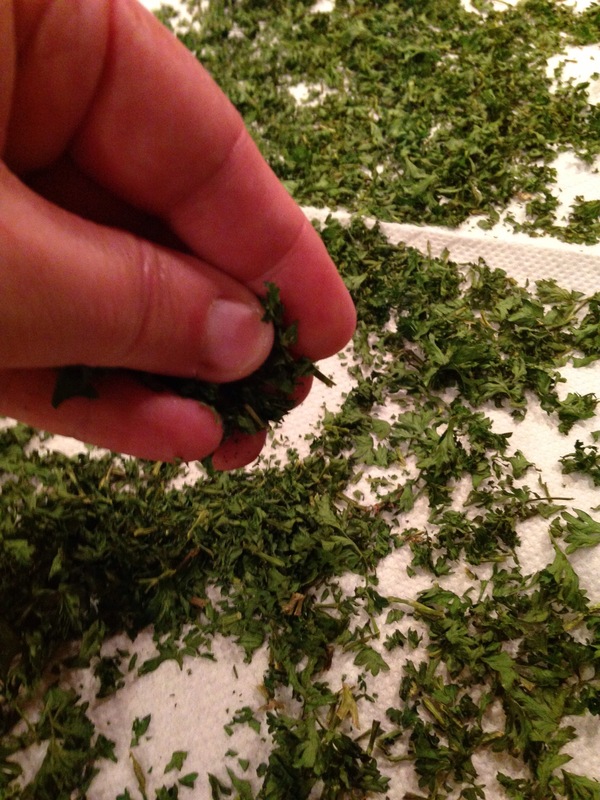 When your roast is cooked and the oven is OFF, pop the cookie tray with kitchen paper and parsley back in the oven. Now go have your dinner. When you return pull out your tray. You will feel that the parsley is crispy and very dry. If not, pop back in. Now your can crush it further or leave as is. But make sure you store in an air tight container. Delicious to use in many recipes. This method also works brilliantly with rosemary. 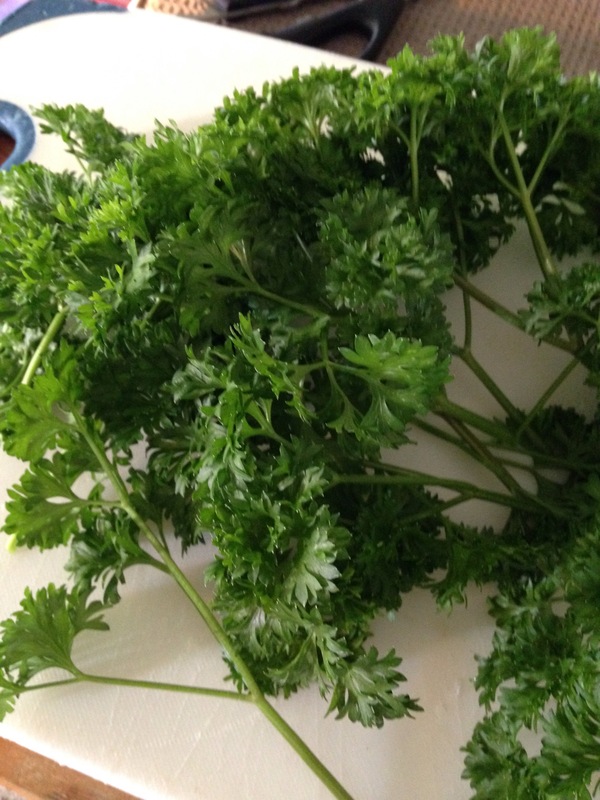 This entry was posted in Green Thumb and tagged chopped parsley, drying, Herbs, parsley on November 8, 2014 by thevintagestand. Next year will see the 100th Commemoration of the commencement of World War One (WW1). The Australian and New Zealand solider who has become known as the ANZAC, has been immortalised into the Australian culture as a result of their heroic actions during this campaign. If you want to know more please head on over to the Australian War Memorial. This post however is about a commemoration project that fellow crafters taking part in around the world. It’s called the 5000 Poppy Project. The ultimate aim is to created a field of poppies as a tribute to these men and women of WW1. 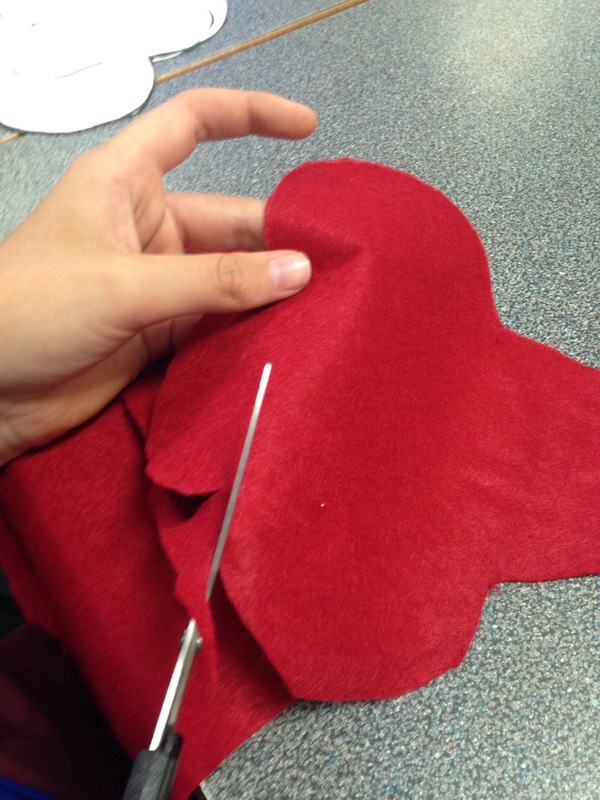 The project has been so well received that now they have almost reached an amazing 50 000 handmade poppies. As a crafter I jumped at the chance and as a teacher why not bring my students along for the ride. Cute hey! 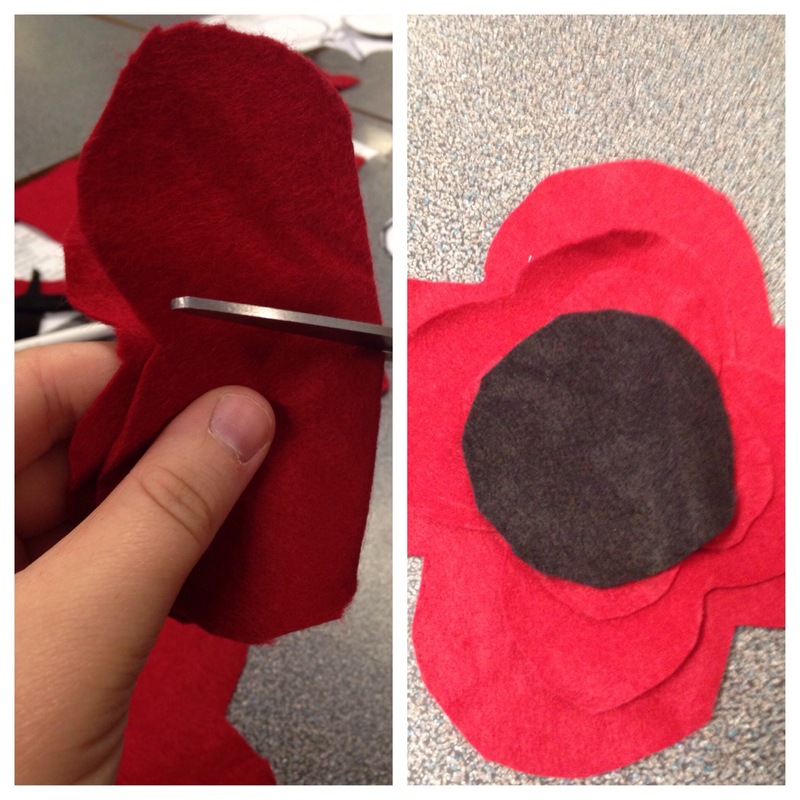 These poppies must be made of some form of fabric and must be able to attach for display, other than that we could design our poppy anyway. What you need for a craft room/classroom. 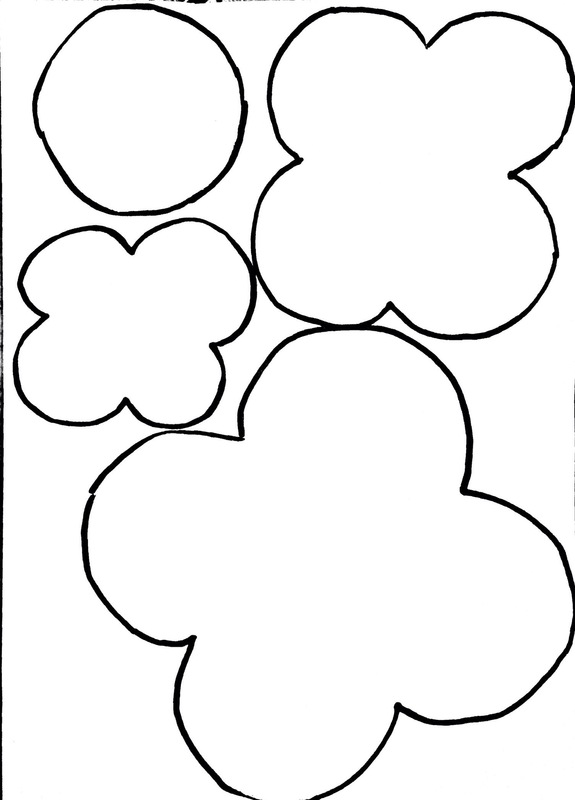 Poppy pattern photocopied to A4 or the patterns from the project site. 5. Push a split pin through the layers making sure the white outlines are on the back. Now time to box them up and send them off to our collection point. 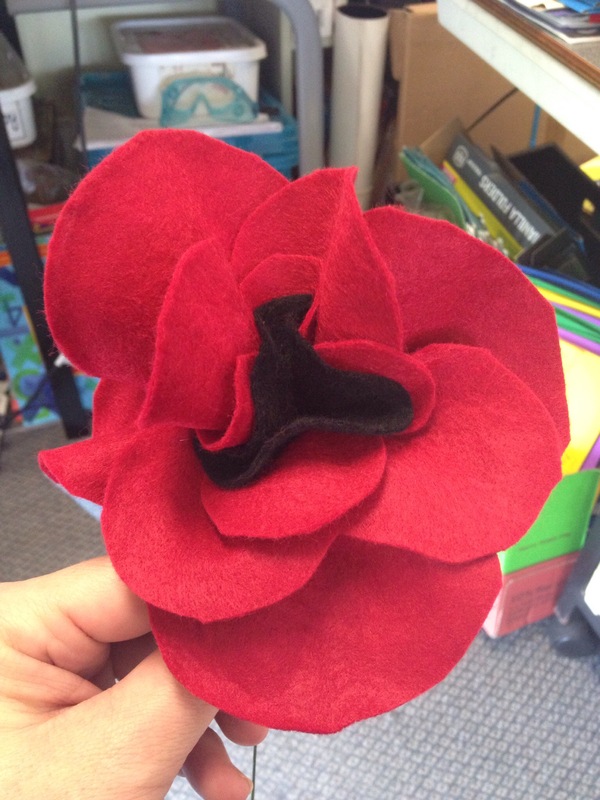 This entry was posted in Simply Crafty and tagged ANZAC, craft, felt, flowers, poppy on November 3, 2014 by thevintagestand. Now I just wanted to try and make a baby gift with a difference. I had two packets of baby socks and a linen blanket. Hmmmm, what to do? Pinterest came to the rescue yet again. 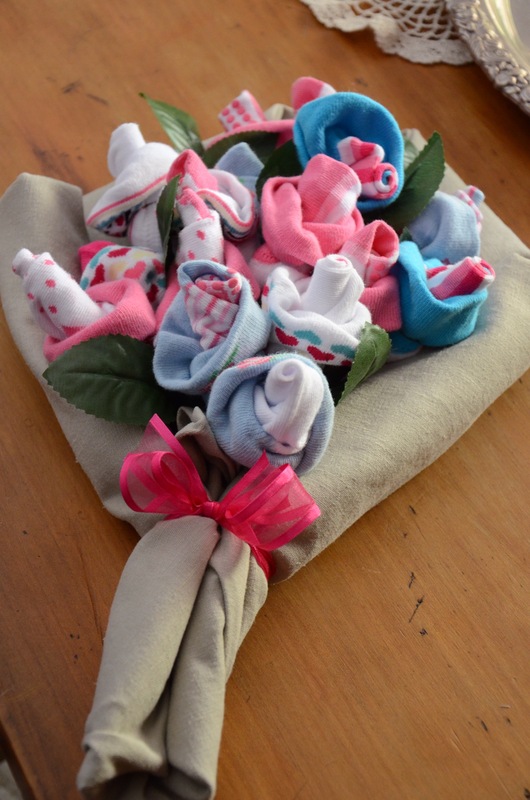 I came across a pin from Homemade Gifts Made Easy for a Baby Sock Bouquet. Too cute! They have recorded not only a photo tutorial but a handy You Tube clip as well. For some other baby gift ideas don’t forget to check out my Pinterest sewing: baby ideas board. I would love you to pop on by. Now I did try the florist tape version as shown in the video to wrap around the base of the sock flower and down the stem (florist wire) BUT I was not happy with that result. It looked messy and honestly was tricky to do with the sock rose unraveling. 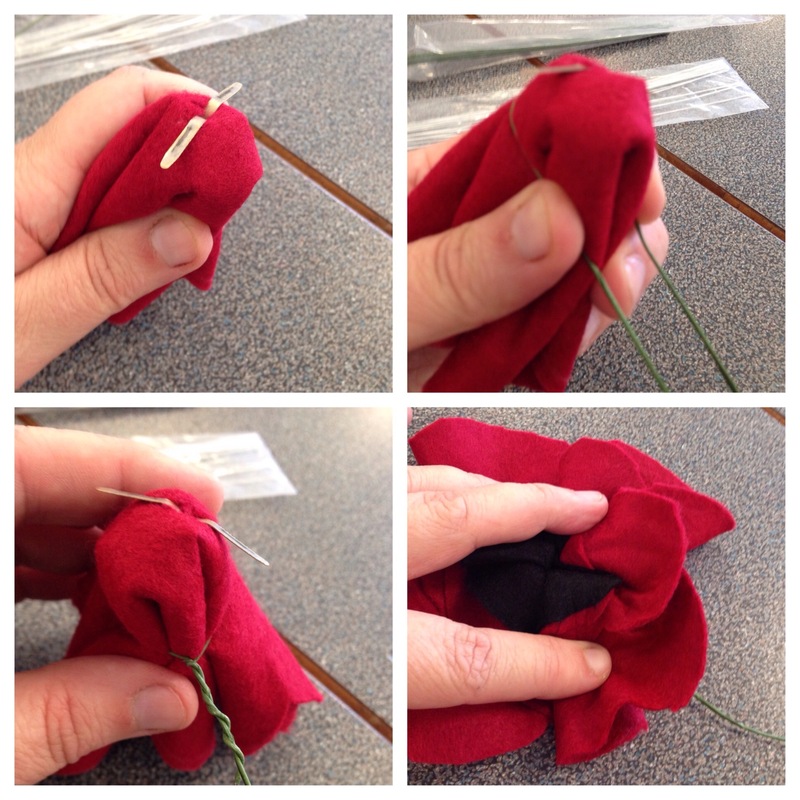 What I decided was to simply wrap the florist wire tightly around the base of the pinched sock. After all the wire will be at the back so it won’t be seen, and I wanted the socks to be easily removed by mum. 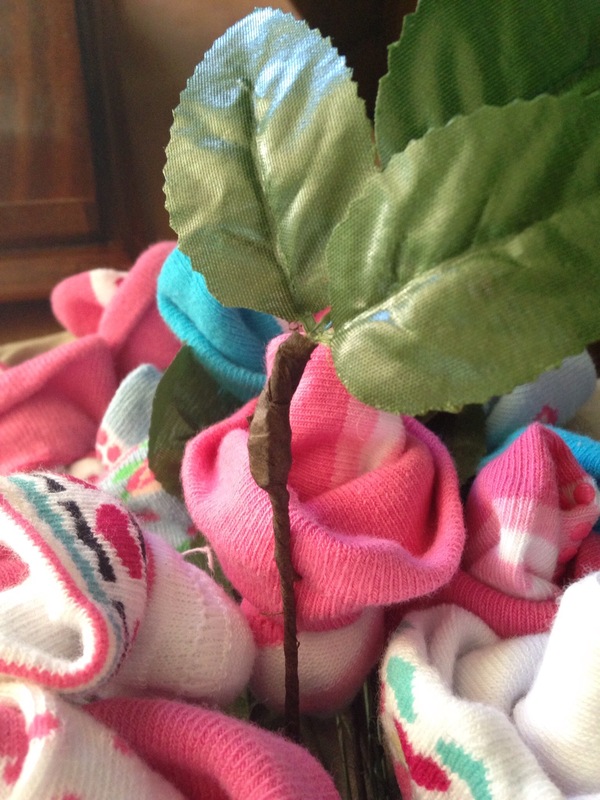 The sock now simply and easily pulls out of the florist wire loop. For the foliage element I simply attached the leaves on their own florist wire. I did use the florist tape this time and found it so much easier to wind around. Overall, I am quite happy with the results. It took me about an hour from start to finish. Thumbs up for a Pinteret idea. 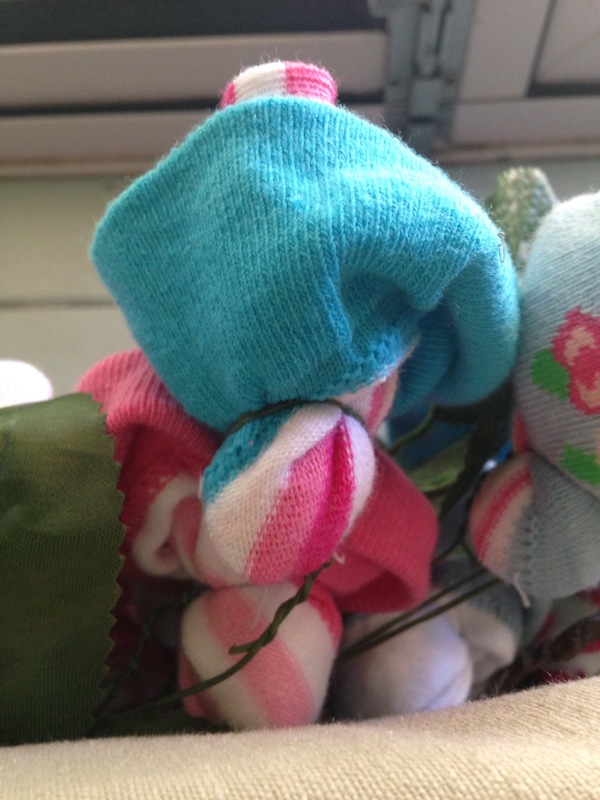 This entry was posted in Baby Love and tagged Baby, baby gift, baby socks, bouquet on November 1, 2014 by thevintagestand. Design your own cover page for Facebook. I love taking photos. It is simple to understand why. See, my husband is SO patient when I get the photography bug, I am in love with my Nikon and I don’t remember life before my iPad :). It’s not only that, but my FB friends are so generous with their “Likes” and “comments” when I photo bomb them. To me photography is just another way to express myself. After all it is consider an art form, so why not a craft. So with this in mind I thought I would share with you some ideas for you to use your photos as a “funky and arty” cover pages on Facebook. You know … that big picture above your status photo. 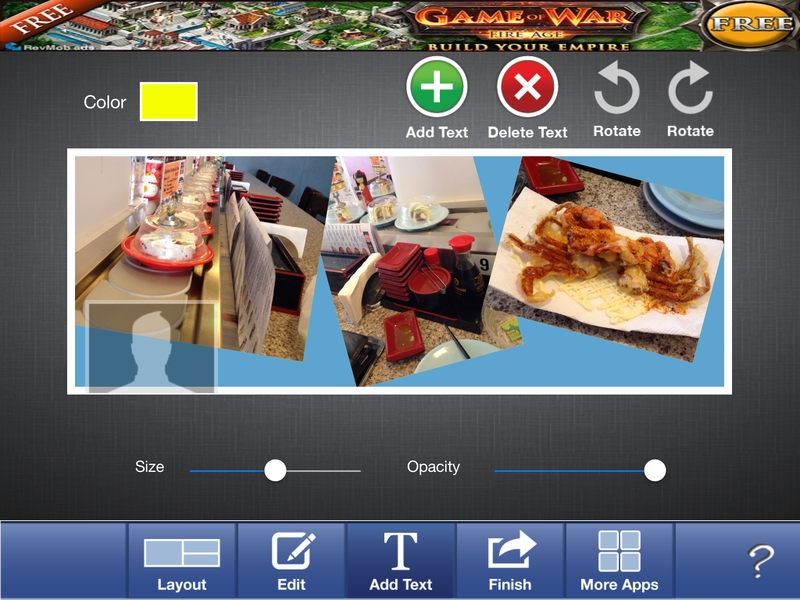 Now this post focuses on the use of a couple of free iPad apps. After all FREE is good, right! Cover Photo Maker : great for manipulating the photos around. Cover Photo Maker for Facebook Free: great for adding text but limited on photo manipulation other than perpendicular squares or rectangles. First, make sure you have a number of photos ready to go on your iPad. You know the ones … the latest holiday, month in review, a great day out. Open the Cover Photo Maker app and use the button on the top left to import the photos. Simply touch the photo to rotate and move the photo around. Hold down onto the photo a bit longer to bring up another menu to help move the photo in front or behind. Have some fun deigning a fun combination. This is a great app for playing with the photo. I love the way it has the Facebook profile picture and other details to help design and fit your cover page exactly. 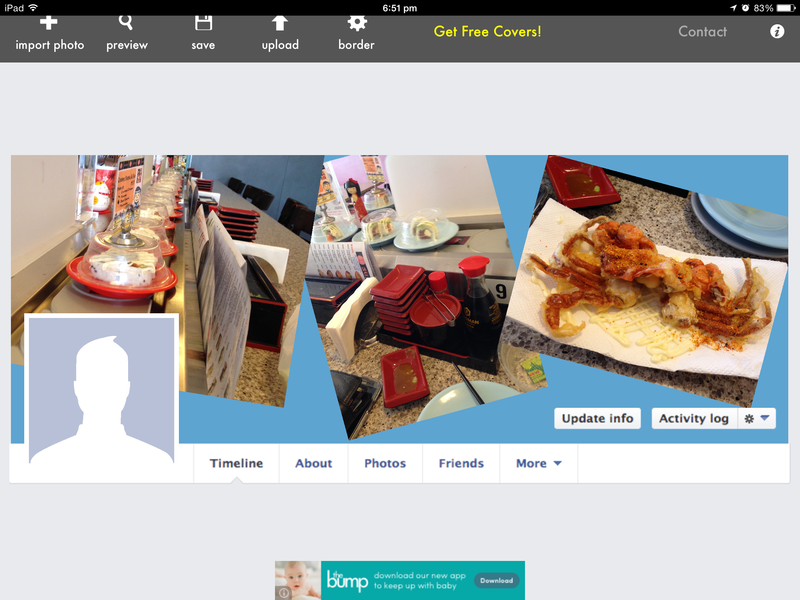 Now, SAVE that photo to your camera roll on your iPad and upload to FB as is. 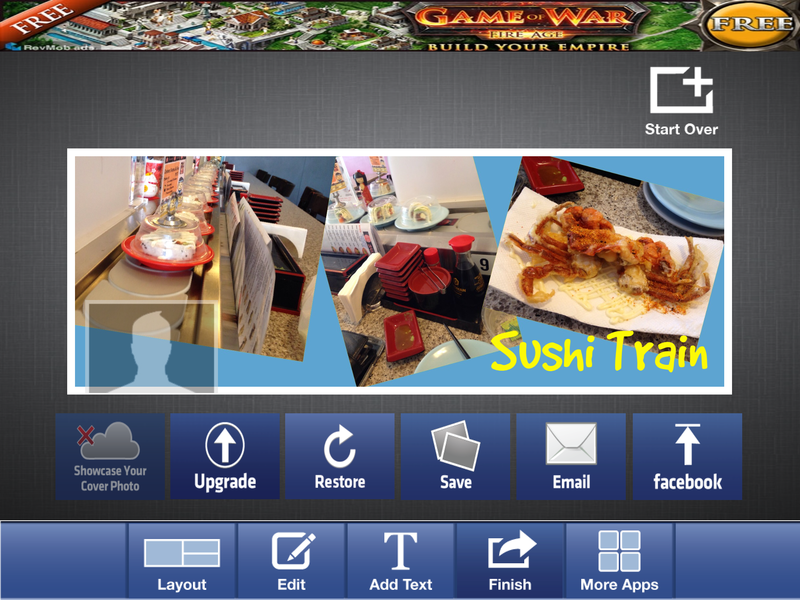 However, if you want to add text, you simply have to check out the next app using the photo you have just made. Now the reason for this is that I am yet to find an app that does what I want. That is … manipulate photos AND add text. So I have “mashed” the two apps together. Open the second app and you will see the layout page. Choose the first layout box and click on the + to import the layout picture you made in your previous app. HINT ! You CANNOT manipulate your photos here anymore. This app mentioned in this blog entry is for adding text to an existing layout. 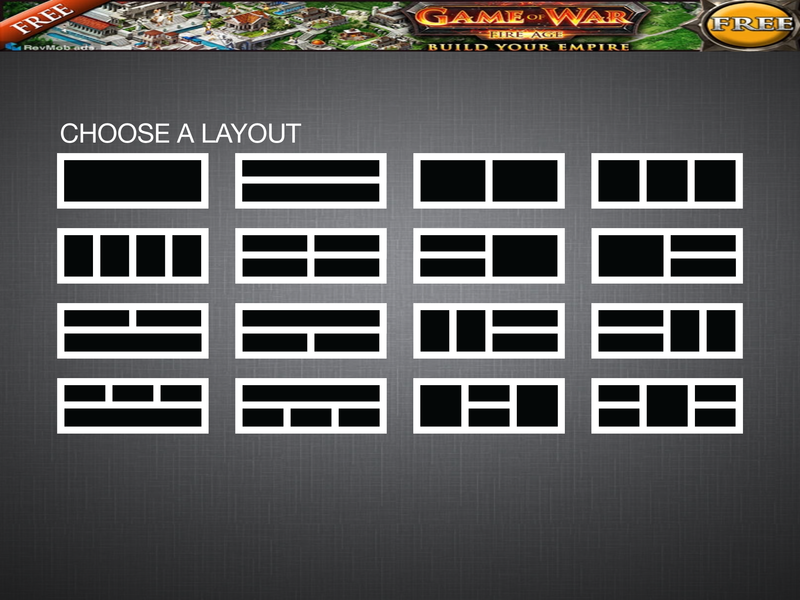 Of course, you can simply use this app by itself and utilise all the layouts if that is what you want. Now you are able to add the text you want you the button. There are plenty of free choices. Remember to play with the size and opacity slide buttons. Remember to contrast the text colours to make it pop. Click on finish and save your work. Now time to head to FB and upload to your cover page. Done! The only drawback to both apps are the ads that pop up, but after all they are free. So if you want those nasty ads gone … buy the versions. This entry was posted in Point and Shoot and tagged App, Cover page, facebook, iPad, photography, photos on November 1, 2014 by thevintagestand. It was announced that we would grandparents for the second time. How exciting, but the question was … What do you make when you are unsure if it’s a boy or girl? Well, that was my dilemma as Bub was going to be a surprise. Don’t even get me started on fabric choices. So off I went to trawl the net once again. I had to start off with blankets. After all Bub and Mum can never have too many. Now I thought fabric choice was a nightmare, but that is nothing to the number of ways to make a baby blanket. OMG! I was about to give up and choose something else when I can across a You Tube clip for a self binding blanket. It saved me. Make sure you really do measure accurately on each end. 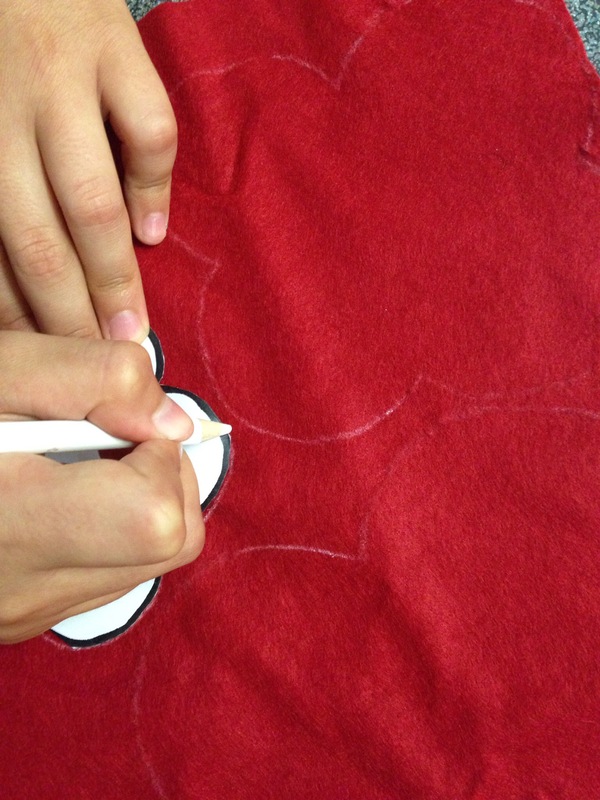 Use a magic disappearing dress makers pen to mark it out exactly. It will make those corners so much more crisp. 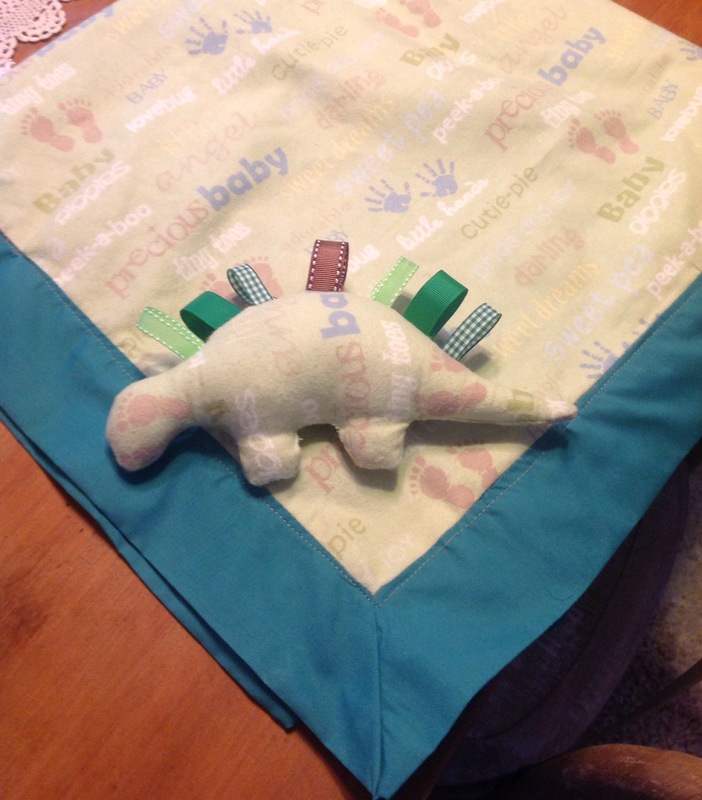 But my blog entry today is not about the Magic Blanket but the matching stuffed Dino toy. Isn’t it just too cute! Beloved-Ones blog has a simple photo tutorial and link to the pattern. I used the pattern and enlarged it by a third for my first attempt. I also used the matching flannelette material to tie my project in with the Magic Blanket. Why not check out my Pinterest board on Sewing: baby ideas for some other projects. Remember to loop the ribbon and place on the wrong side facing down into Dino. I double stitched over these loops to ensure they didn’t pop out with exuberant play. Why not add a jingle bell inside Dino too. This entry was posted in Baby Love, Needle n Thread and tagged craft, Sewing, toy on October 30, 2014 by thevintagestand. See food and eat it ! I totally adore mussels and my local fish shop supplies the absolute best. I have even arranged them to call me when they have a supply in. 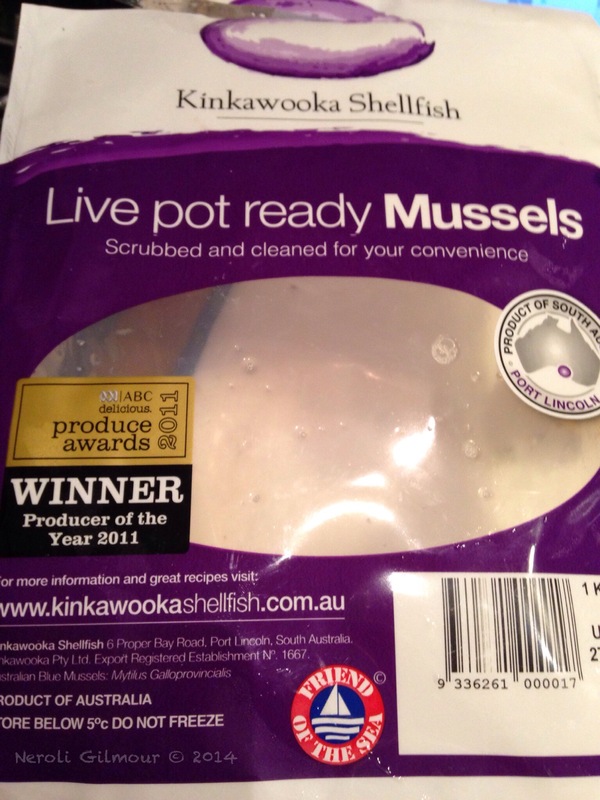 I use … nah devour … the Kinkawooka Shellfish live mussels. They are totally divine and if can you simple must try them. The come totally ready to eat, cleaned and sorted, so no mess or fuss. A 1kg bag is $10 at my seafood shop. Tonight I ventured out onto a new taste sensation. Thai curry flavours was in order so hi-ho, hi-ho off to the net I go. Yes, the Internet can simply overwhelm you with the number of recipes and time does not permit you to try them all out. But this one I have created and I was super impressed. So much so that I took a number of photos and even Facebook on my personal account. I didn’t have a red curry paste available so simply used a green curry paste that was in my fridge. Yummo! Keep the coconut stock and strain through a super fine sieve. Then used it as a base for a scallop and prawn dish for a hubby who doesn’t like mussels. But that’s for another blog. 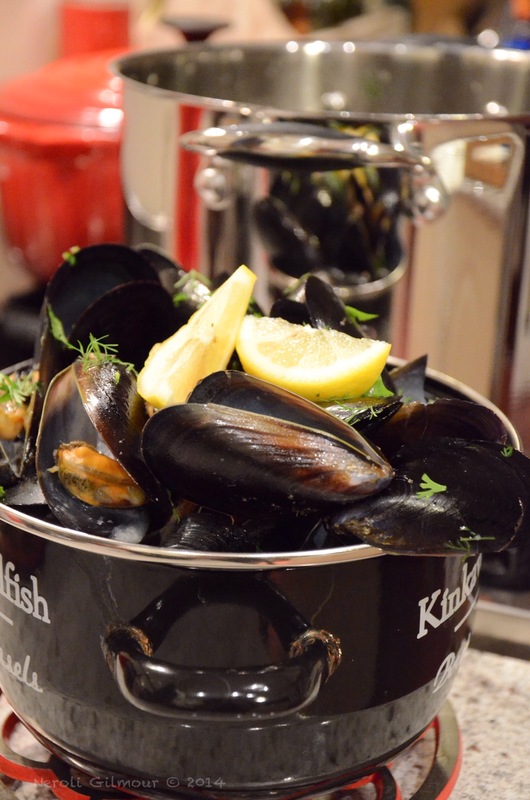 This entry was posted in Cooking Up a Storm and tagged food, mussels, recipes, Seafood on October 28, 2014 by thevintagestand.